For more than 10 days leading up to yesterday's win over Castres, the Munster squad have found themselves at the heart of a media storm not of their making. After they had beaten the French side to secure a home quarter-final against Toulon, the wider squad gathered in their changing-room to celebrate their win - and the man at the heart of that storm, Gerbrandt Grobler, stood arm in arm with his team-mates. For better or worse, they are backing the 25-year-old South African who served a two-year suspension between 2014 and 2016 after testing positive for an anabolic steroid. By the time they return to Limerick in April to take on the three-time European champions, Grobler could well have played his way into the Champions Cup team. He was a standout performer on the pitch when the 'A' side beat Ospreys at Irish Independent Park on Friday night, and he is registered in their European squad. Amid the furore, Munster have managed to pick up the six points they needed in their last two pool games to secure a lucrative home fixture in the last eight, showing an ability to block out what Jean Kleyn - a fellow second-row and fellow South African - described as "the white noise" surrounding them. Yet they are fully aware of the blanket coverage Grobler's presence in their squad has received. "Look, at the end of the day we are a team," the South African said. "As Munster, we play for each other and we back each other. "Even though some guys might have made mistakes in the past, I think Donncha O'Callaghan stated it very well when he said 'hate the sin, don't hate the sinner'. "And I think that is mostly what we do - we support each other no matter what we go through. "Mistakes were made, turned over a new leaf and we support him fully. "It's the same as any other game, there will always be a lot of media and white noise in the background. "What is important to us as a team is that we don't focus on that white noise, we focus on our internal structures and play for each other. "That's what we did, we blocked out the white noise and played for each other." Their team spirit will stand to Munster in April when Toulon arrive in Limerick for the quarter-final. Although the French side are not as strong as they were when Munster last came across them, when Toulon were in the middle of their stranglehold on the competition in 2014, they still possess a squad full of stars. Not that Munster will fear them. "Look, what you have to remember is that we are also a really experienced European team with a lot of internationals," Kleyn said. "Other teams are talked up a lot of times, but within Munster we have a lot of talent and a lot of experience as well. So, yes, we are ready and we do have a lot of belief. "You go out at the start of the season and you say you need to get a least a home quarter-final, and you know if you could have secured a home semi-final that would have been the top prize. "We haven't got that so now it comes down to winning the quarter-final and doing the prep for the semi-final to come. "Obviously there is a massive task ahead of us with Toulon - they're an extremely strong side full of internationals. Yeah it's going to be a challenge but I'm sure the boys are up for it." 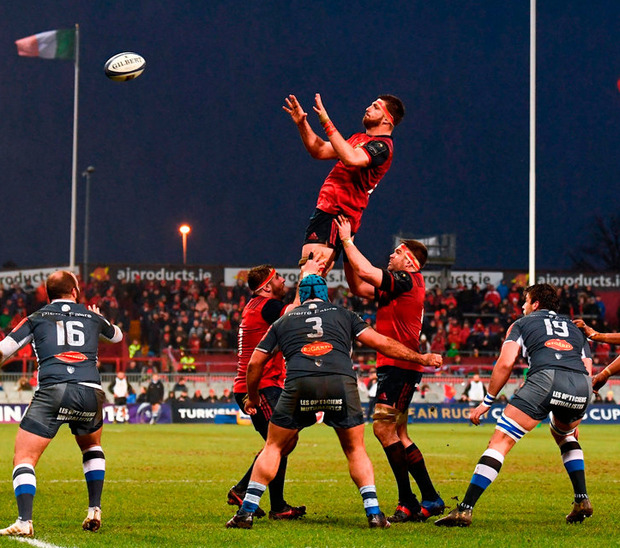 It was an unusual day for the players at Thomond Park as they dealt with a three hour delay to kick-off as a result of the relentless rain that hit Limerick during Saturday night and Sunday morning. Referee Ben Whitehouse deemed the surface unplayable for the scheduled 1.0 start, so the squad had to retire to their team hotel to begin preparations again. Kleyn managed to sleep during the intervening period and the South African was amazed to see so many of the fans had stuck around for the late start. "I'd say the support," he said when asked if he had any stand-out memories of the day. "I never for a million years thought that the stadium would be packed again after a three-hour delay, I didn't see it happening. "When we arrived on the bus I thought, 'jeez, it's going to look like a PRO14 game in there'. "I was blown away when I walked on to the field first, it was packed, so that's probably something I'll take with me." That support will be out in force come Easter weekend when the three-time champions come to Thomond Park for a heavyweight quarter-final tussle.